Among ASEAN members, alcohol and tobacco are estimated to contribute annually to nearly 350,000 and 500,000 deaths, respectively. As such, an important public health priority is discouraging consumption of alcohol and tobacco. Raising consumer prices is widely recognized to be the most effective public health policy. Price increases can be achieved through conventional excise taxes, as well as through trade policy through, for example, tariffs. However, trade policy under the guise of public health concerns may also be used to protect domestic producers from foreign competition. 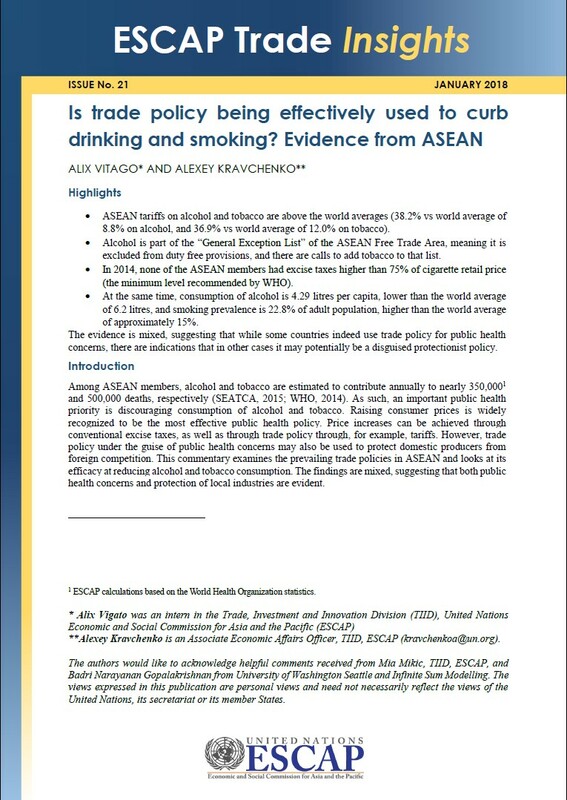 This commentary examines the prevailing trade policies in ASEAN and looks at its efficacy at reducing alcohol and tobacco consumption. The findings are mixed, suggesting that both public health concerns and protection of local industries are evident.